CRDC participated as a sponsor at the Greater Manchester Chamber of Commerce's, ACCESS Greater Manchester Annual meeting. 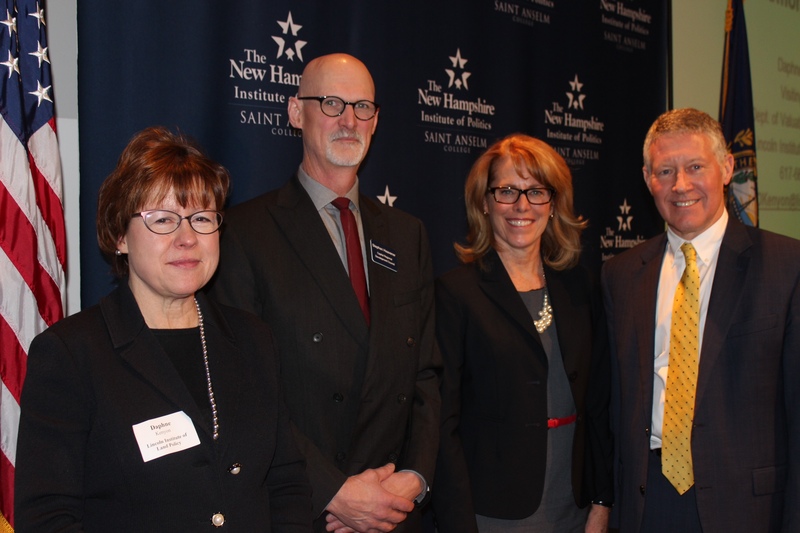 The event held at the NH Institute of Politics at St. Anselm College brought a crowd of more than a hundred business leaders, comprised of bankers and economic development offices across the southern part of the state. The keynote speaker was Daphne A. Kenyon an economist and visiting fellow from the Lincoln Institute of Land Policy in Cambridge, Massachusetts. She presented, "What You Should Know About Property Taxes and Economic Development. "During her presentation, she reminded attendees to embrace NH's no broad-based income or sales tax and to promote the "New Hampshire Advantage". The Access Greater Manchester Annual Meeting is an opportunity for development professionals and other business leaders, municipal staff, and elected and appointed officials from across the region to gather together to network and learn. PHOTO CAPTION: L-R: Daphne A. Kenyon of the Lincoln Institute with CRDC Executive Director, Stephen Heavener, Robin Comstock, President, GMCC, and David Preece of the Southern NH Planning Commission.